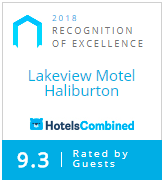 Located on the outskirts of the Haliburton Village, the Lakeview Motel is only 2.5 hours northeast of Toronto and just south of Algonquin Park, in the beautiful Haliburton Highlands. The Lakeview is more than just a motel. It is a family-run business with customers who come back year after year to enjoy our beautiful location and personal approach. We pride ourselves on our welcoming atmosphere, friendly service, and well-appointed smoke-free rooms. Our 14 rooms are modern and comfortable, and we offer many of the amenities and activities that provide the convenience and atmosphere of a larger resort, including dining facilities, a full-size heated pool, private hot tubs, and free wireless internet. You can snowmobile or snowshoe right from your door in the winter, and swim in our pool or go for a hike on the property in warmer weather. We invite you to come and spend some time with us and experience all that Haliburton has to offer. Feel free to call us or send an email if you can’t find the information you’re looking for online.